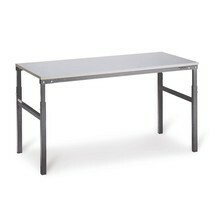 The packing bench has height-adjustable legs. They allow you to make individual adjustments so that you can maintain an ergonomic posture while standing and sitting. 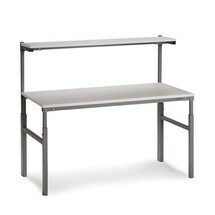 This packing station basic bench is height adjustable. The workbench can thus be adapted according to individual preferences and according to the intended purpose. In this way, you are able to achieve a pleasant working environment at an ergonomic height.